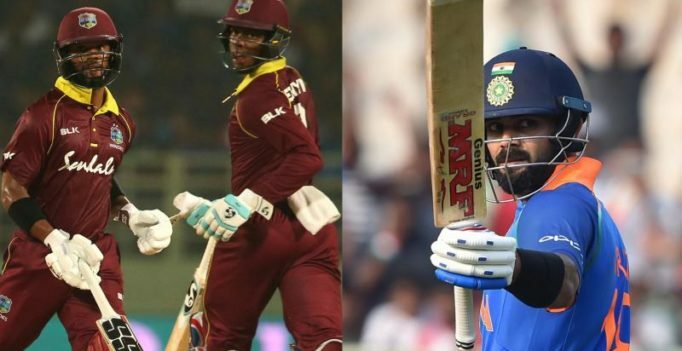 Visakhapatnam: Centurion Shai Hope hit a last-ball boundary to help West Indies tie the second one-day international against India despite Indian skipper Virat Kohli’s dazzling 157 on Wednesday. Needing five runs on the final ball to chase down West Indies’ target of 322, Hope – who made a total of 123 – got four off Indian paceman Umesh Yadav as the tourists ended on 321-7 in their 50 overs. Earlier Kohli became the quickest batsman to reach 10,000 ODI runs on his way to his second successive century and help India amass 321-6 after electing to bat first. The hosts lead the five-match series 1-0. The West Indies were in trouble at 78-3 when Hope infused life into their chase and put on 143 runs for the fourth wicket with Shimron Hetmyer, who blasted 94 off 64 deliveries. The left-handed Hetmyer, who came into the match on the back of his 106 in the West Indies’ opening loss, smashed four fours and seven sixes to unsettle the Indian bowlers. Hetmyer though fell short of what would have been his fourth ODI ton after top edging one of Yuzvendra Chahal’s leg spinners to get caught by Kohli at cover. Hope then kept his calm to put together another 47-run crucial partnership with skipper Jason Holder to nearly pull off victory for the West Indies. Hope, who registered his second ODI ton, kept chipping away despite some tight bowling by the Indian pacemen and Holder’s run out. Kohli’s heroics that came at the back of his 140 in India’s opening win on Sunday. Nicknamed “King Kohli”, the prolific run-getter was dropped on 44 by his opposite number Jason Holder off debutant Obed McCoy and made full use of the reprieve. He put on 139 runs for the third wicket with Ambati Rayudu, who made 73. Rayudu took stock along with Kohli after India lost their openers for 40 as the batting duo rebuilt the innings and counter-attack. Rayudu was bowled by spinner Ashley Nurse. It was an all Kohli show after that, with the star batsman hitting 13 fours and four sixes to take the steam out of the West Indies bowling attack. Kohli took a single off Nurse to eclipse the 10,000-run mark, before going on to score a hundred with a boundary off Marlon Samuels. He also got past 1,000 ODI runs in just 11 matches this year. McCoy cleaned up Mahendra Singh Dhoni for 20 to claim his first ODI wicket and ended up with two scalps. Nurse was the pick of the West Indies bowlers with his figures of 2-46. Earlier, Indian skipper Virat Kohli on Wednesday said his priority stays with his nation and that he would never support anyone who opposes his country….